It’s not quite the Lion King’s sentiment of “everybody look left, every body look right, everywhere you look on the Upper East Side there’s a new restaurant popping up”—wait, that’s not how the song goes?—but there are a few new comers to the neighborhood to get excited about and Blake Lane is definitely one of them. A narrow space that has had one dark dismal janky fast food restaurant after the next, has been transformed by restauranteur Suzanna Beall into a clean white subway tiled, mirrored bright space with natural wood tables that are each topped with a clear bud vase with minimalistic flowers to set the mood for her California-styled eatery. Partnering with Chef Diego Moya, whom you may know from the incredible eats at Casa Mono, the team has created the quintessential lunch spot that has been missing from the neighborhood. Yes, they are open all day from eight in the morning to eleven at night but my elation comes from finding a restaurant that doesn’t feel like I’m eating dinner midday or a thoughtless drab salad on the Upper East Side. Nope, here the menu is colorful and pops next against the bright space much like if you took a red paint brush and dragged it across a stark white canvas. I have to admit, when I looked at the menu, in visiting as many restaurants as I do, I was really nervous about what kind of dining experience I was going to get. It’s an super diverse menu which often means that there are a lot of weak dishes—in the words of our president elect, “wrong”—not here! 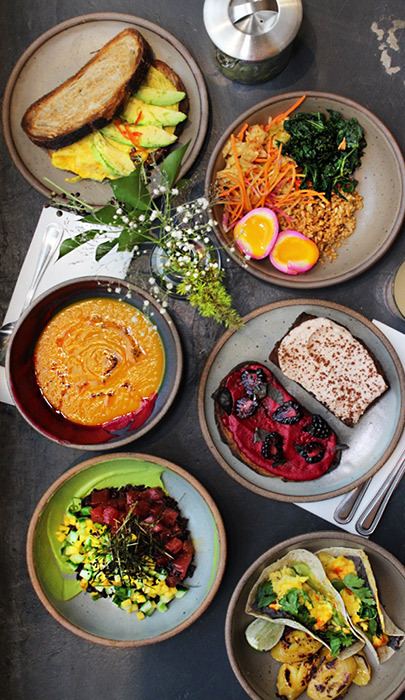 From the Chia Pudding, to the Bibimbap, to the Breakfast Tacos, to the Poke every dish is delicious. Back to that art analogy, there was a clear style to the food that let me know that each dish was conceptualized and developed by the hands of the same chef. Yes, somehow these disparate menu items felt cohesive and I couldn’t be more happy about it! I’ve officially stumbled upon a neighborhood gem. You’ve gotta go eat there for yourself! Tired are the days of there being nowhere exciting to eat on the Upper East Side, let’s celebrate in this something new!